If your car engine is not running efficiently, or if a warning light is blinking, you need expert assistance. At Makley Motor Specialists, we provide you with top quality engine diagnostics to accurately find out all the faults in your car at our fully equipped workshop in Eastleigh. Get in touch with a specialist for more information. We also provide car servicing and repairs, van servicing and repairs as well as MOT preparation. With the help of timely engine diagnostics and repairs, you can find out problems in advance and save parts of your engine which could have cost you a lot more to repair or replace later on. You will also be increasing the lifespan of your vehicle. 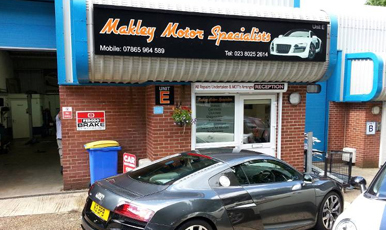 Makley Motor Specialists provides services in Eastleigh, Southampton, Winchester, and Portsmouth. Pinpoint the problem in your car with engine diagnostics from Makley Motor Specialists.